There are super groups and then there are sort-of super groups. 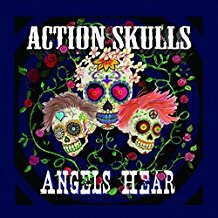 John Cowsill of the 1960’s pop group the Cowsills, Vicki Peterson of the Bangles, and Bill Mumy, producer, singer, and child actor of Lost In Space “Danger Will Robinson Danger,” have combined their talents to produce the album Angels Hear by their newly formed group, Action Skulls. The harmonies are not only well-crafted but interesting. Their voices are very different but they blend together well. Whether the style is laid back or energetic, the harmonies which can be subtle or soaring and remain the foundation of their sound. Angels Hear was about four years in the making. Eight songs were recorded, when original member, bassist Rick Rosas passed away. That loss and their own schedules put everything on hold for several years. Whether the Action Skulls ever record another album remains to be seen; but Angels Hair is an excellent album of well-crafted pop that proves musicians from different backgrounds can create very listenable music together.